Amid VW Scandal, Critics Want Access To Carmakers' Computer Code : All Tech Considered Most of us are unaware of what goes on under the hood of our car. Some people, including safety researchers, would like to access the software. But a 1998 copyright law stands in the way. 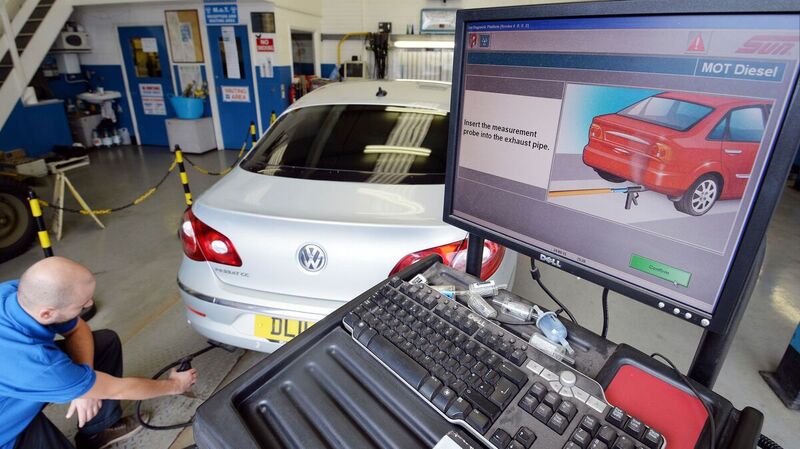 A Volkswagen Passat is tested for exhaust emissions, at a Ministry of Transport testing station in London. In the U.S., a 1998 copyright law prevents safety researchers from accessing the software that runs cars. The revelation that Volkswagen rigged software to cheat on emissions tests got us wondering: What else is the software in your car doing that you don't know about? Well, that answer, for the time being, will remain a mystery. That's because there's a little-known law in the U.S. that bars car owners — and researchers — from accessing the software inside vehicles. There are as many as 100 million lines of computer code in some new cars. They help control the steering, cruise control, air bags, entertainment and anti-skid systems. The technology is amazing, but Zeynep Tufekci, an assistant professor at the University of North Carolina, points out there is a cost. "The computers in our cars help us brake better when it's raining. But we have to realize it doesn't come without issues; it means that you have an intelligent object that is serving its corporate owner at all times because we don't have ... independent access to the code," she says. Most of us are blissfully unaware of what goes on under the hood of our car. But some people, be they tinkerers, geeks or perhaps, most important, safety researchers, would like to access the software. But under the Digital Millennium Copyright Act, now they can't do that legally. Congress passed it in 1998 in part to protect DVDs from being pirated. But courts have also interpreted the law to keep people from accessing the computer code in cars, homes, even tractors. Kit Walsh, a lawyer with the Electronic Frontier Foundation, thinks this is wrong. "Think of crash test dummies," he says. "Those safety tests are relied on by a majority of Americans in deciding what vehicles to trust and to rely upon. And the same kind of analysis should be possible with computers, given the crucial role that they play in controlling safety-critical systems as well as emissions systems." Walsh says if independent researchers had access to the code in VWs, for instance, they might have detected the cheating software much sooner and revealed that the clean diesel the company touted in a recent TV ad wasn't so clean. An exemption to the law that would allow researchers and owners to access car software has been fought by the auto industry. And, Walsh says, the industry had an unexpected ally. "We were surprised to see that the EPA wrote in against the exemption, particularly given that the investigation against Volkswagen must have been underway at that point," he says. In a July letter to the U.S. Copyright Office, the EPA argued that allowing owners to access the software could result in tampering in a way that could increase emissions. Ironically, that's what VW itself did. The EPA did not respond to a request for a comment. Democratic Sen. Richard Blumenthal of Connecticut says researchers should be able to get into the software. "There should be access to the source code, that is to the software, so that consumers and researchers are able to protect the public against this kind of deceptive action," he says. The Copyright Office could act as soon as next month on such an exemption for researchers and others.